Courtney Pine and Zoë Rahman combine to close the new Priory Park Festival, one of the highlights of this year’s Festival of Chichester, on Sunday, July 10 at 8pm. They will be presenting Song (The Ballad Book) on the festival main stage in Priory Park. The album offers a celebration of timeless classic songs, given emotional intensity by reeds maestro Courtney and Chichester’s piano virtuoso Zoë. “It’s an album of music and an approach that I haven’t done before,” explains Courtney, “and it is using an instrument called the bass clarinet. “It’s my favourite instrument. It has got a seven-octave range, and there are not that many bass clarinet virtuosos around that are well known. “You think of the sax, and you can think of lots of people, but really the bass clarinet is not very well known. You are playing it and you are thinking ‘Who can I copy? Who can I learn from?’ But you realise that actually you have got to stand on your own two feet and create something that is entirely you. “I also wanted to do something that was a duet, and Zoë is brilliant. She came on a project with me called Europa, and I thought she would be ideal. “She is not only a fantastic classical pianist, she has got a great understanding of improvised music as well. I just felt she would fit, and that was on Europa where the premise was ‘What is Europe?’ She had such a great attitude to working with musicians that are playing at a really high level of ability, and then I thought about her own sound and approach, and she was just right. “There are lots of melodies that you could think of, but I wanted people to hint at the lyrics while I played it all as an instrumental. I remember listening to Grover Washington Jr.
“He was the leading exponent of smooth jazz, and he was a fantastic player. I remember seeing him performing live on TV playing this famous song by Billy Joel, Just the Two of Us, the way he played it, the way he moved the crowd with no lyrics. “ I knew the lyrics, but the way he played it on sax was actually better than the vocal version, and I thought it would be good if I could try to do an album that was like that. “So I thought of all the love songs and then things changed a bit. I had a list, but this was last November, and there was a news article about this guy who put his hands up in America and a policeman shot him in the back of the head. “I was really shocked that that was happening still in 2015. So I started looking at songs like Some Day We Will All Be Free, and I was also looking at Amazing Grace. I was thinking it was just the one-nil chant at football games! “But it turns out it was a song about a slaver throwing all the chained slaves off his ship because he is about to get caught and he doesn’t want to get caught with all the slaves on board. 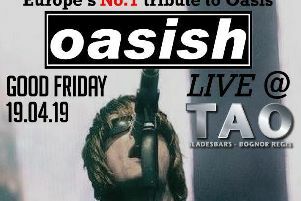 For VIP, discounts and weekend tickets: www.chichesterlive.co.uk. Tickets £19; 11-18 years £10. Disabled access.